Patrick Reynolds rips family's company for supporting amendment to let smoking continue in bars and restaurants. 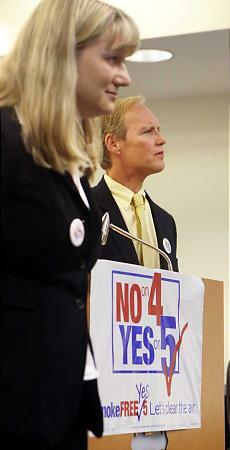 DAYTON — An unlikely opponent of smoking and big tobacco companies stopped in Dayton on Thursday to urge voters to vote no on Issue 4 and yes on Issue 5, the competing smoking measures on the Nov. 7 ballot. 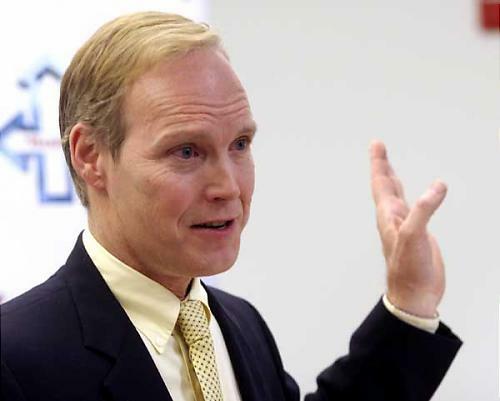 Patrick Reynolds, grandson of the late tobacco kingpin R.J. Reynolds, blasted his family's company for supporting Issue 4, Smoke Less Ohio, a constitutional amendment that would allow smoking to continue in bars, restaurants and other entertainment venues. "They're telling us it protects nonsmokers," Reynolds told 100 audience members gathered in the Reibold Building downtown. "Nonsense. It protects their profits." Reynolds appearance came on the same day Smoke Less Ohio released a list of its contributors. R.J. Reynolds gave all but $11,400 of the group's $5.4 million collected to date. Issue 5, backed by the American Cancer Society, health commissioners and health advocates across the state, would ban indoor smoking in all public places and work places, including bars and restaurants. Issue 4, or Smoke Less Ohio, also calls for banning smoking in public places but is less restrictive. It would also abolish 21 local ordinances, including Centerville's, that ban smoking from indoor public places and work places, including bars, and it would prohibit municipalities from passing such laws in the future. While Issue 4 allows smoking in restaurants, it calls for smoking areas to be walled off from nonsmokers, a frivolous measure to Reynolds, a former smoker. "Secondhand smoke just doesn't know how to stay in smoking sections," he said. Jacob Evans, spokesman for Smoke Less, said, "With all due respect to Mr. Reynolds, he doesn't live in Ohio and simply dropping by the state for a few days doesn't mean he's in touch with what Ohioans want." Reynolds, 57, lost his father and older brother to smoking-related diseases, he said. He said he gave up his stock in R.J. Reynolds in 1979 and embarked on his anti-smoking campaign in the late 1980s. "It did cost me," he said. "I'm not a wealthy man."